All requests for fund raising events for registered Charities must attach a letter from the charity stating you have registered or permission to use their name. Fees includes local travel costs, sick pay, holiday pay, insurance, overtime,commissions and income tax. 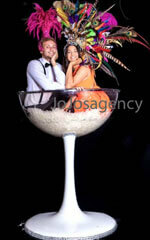 As professional performers they do not offer services in lieu of any requests as this is their livelihood. The Crooked Bookies greet your guests and hand out fake betting money. They begin to rove the function talking up the races and creating a fun atmosphere. At a given time they announce that they are now taking bets on the first race and invite the guests to place bets with them like real bookies. Once all bets are in the they call the first race of the evening. The race is on DVD and is displayed up on the big screen. One of the bookies does a live call. The names of the horses have been substituted with names supplied by the client. (guest names or suppliers names etc.) At the end of the race guests collect their winnings and place bets on the next race. Between the races the Bent Bookies rove the room chatting up the ladies and talking shop with the guys. 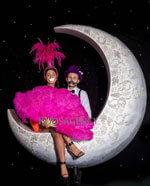 The Crooked Bookies are just the thing to liven up your party or event. 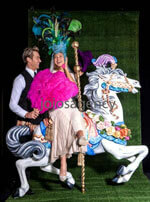 Ideal for horse racing themed events. From 10 people to 1,000 people. music, powerful projector and screen. The Crooked Bookies will rove your event Creating mischief. Murder Mystery Night makes a fun night for all. Enjoy your very own mystery entertainment in your own venue. Become a major suspect, throw in a red herring or just sit back and enjoy the fun. “whodunnit” is a great nights entertainment that involves everyone. Let us take care of everything as we provide a host who plays the comic detective to conduct the investigation, nametags, music to suit the theme and prizes. Best of all, we come to your venue for any number of guests. Around a meal with drinks, a cocktail party or a simple supper, a Murder Company Whodunit is theatre restaurant at its best. There are many themes to choose from and everyone gets a part in the fun. You choose which of your guests are to be questioned by the detective and their secrets revealed and which can have a smaller role that spreads around the gossip. The whole room is involved in watching the story develop and trying to guess our secret murderer. The Company stands out because it creates a show where the audience are the stars. When you come to one of our mystery nights you don’t just watch the show, you are part of the show. Our talented team of actors create a fun, comfortable atmosphere where members of the audience are encouraged and applauded to take part in solving the crime without doing the time. Our parties never die, just some of the guests!